ARLINGTON, Va.–The unique topic of artificial intelligence (AI) for humanitarian assistance and disaster relief (HA/DR) was in the spotlight last week, as leading minds from academia, industry and the federal government met to discuss how modern technology can help victims of disasters around the globe. 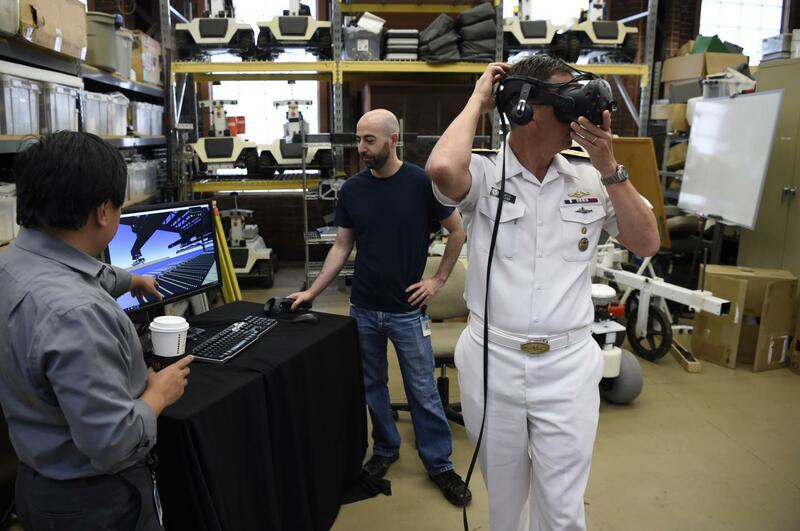 The Artificial Intelligence and Autonomy for Humanitarian Assistance and Disaster Relief Workshop–co-hosted by the Office of Naval Research (ONR) and Carnegie Mellon University (CMU)–took place at the university's Pittsburgh campus Aug. 2-3. "The problem of catastrophes affecting humanity will unfortunately always be among us," said Chief of Naval Research Rear Adm. David J. Hahn. "The great minds in this room are here to figure out how we can best leverage artificial intelligence and autonomy to better deliver resources and people to those in urgent need." As Hahn addressed the group, pictures of naval relief efforts over many years scrolled behind him, including Sailors and Marines assisting victims in Haiti after an earthquake, Japan after an earthquake and tsunami, New Orleans and New York after hurricanes, and more. Hahn noted the Navy and Marine Corps are uniquely suited to support rescue and relief work done by different federal agencies, when called upon. Naval assets include ships, planes and helicopters; being positioned globally; and being highly mobile. Dr. Andrew Moore, dean of CMU's School of Computer Science, thanked Hahn for helping to inspire the meeting, which included renowned AI-focused academics; senior representatives from the Federal Emergency Management Agency (FEMA); leaders from the new Joint AI Center; relief directors at the U.S. State Department; representatives from NASA, the U.S. Army and Air Force; and many more. Some in attendance had been on the ground providing assistance on multiple occasions, from natural disasters to war zones. "We've brought in some of the best roboticists and technologists in the world, with the single goal of keeping people safe during disasters" said Moore. "Technology to save lives is inspiring for everyone in the AI field." AI and autonomy are wide-ranging terms that include multiple fields of study and are increasingly relevant to disaster relief work. Some of those focus areas include machine learning, human-computer interaction, big data analytics, computational modeling and robotics. Several speakers at the event discussed real-world examples of how AI could help victims of disasters, including better using unmanned aerial vehicles to find survivors; using robots to communicate with trapped victims–for example, under the rubble of a building; generating the most accurate data on emerging damaged areas, using crowd-sourced social media reports; and computer models and simulations to predict the best ways and tools to help in different disaster situations. Both Hahn and Moore encouraged workshop attendees to not let the meeting's value fade. A series of working groups addressed multiple topics and were requested to come up with short-, mid- and long-term ideas on how to utilize AI in real-world HA/DR situations. Follow-up meetings are currently being slated to track progress.